I love playlists! Well, I could say it’s themed blog playlists I love, because I don’t really make book playlists and there are no organized playlists in my phone, all the music is just crammed in there. Anyway, I have a small list of the type of tunes in our music library that can turn the simplest of food runs into Epic Nerd Quests. I really do sit up straighter and drive differently whenever a track from Pirates of the Caribbean comes on. Suddenly my messy mom van becomes a stately pirate ship, navigating the unplowed roads of Boise with ponderous grace. Until I crash into a parking lot snow mountain. But then I just Fus Ro Dah all that dirty snow away! On the subject of playlists and music, over at Behind the Steam we just released our Top 10 Steampunk Songs for the new year! Go check it out. Most of it is epic enough for nerd adventures! Do you have any playlists that put you in an adventurous or happy mood? What about playlists for your books or general writing? The Sims Saga – The kids and I will never forget these “family” stories as long as we live. Fatty Catty, An Adorable Baby, and An Adorably Weird Husband – One of my old “funny pictures” posts! 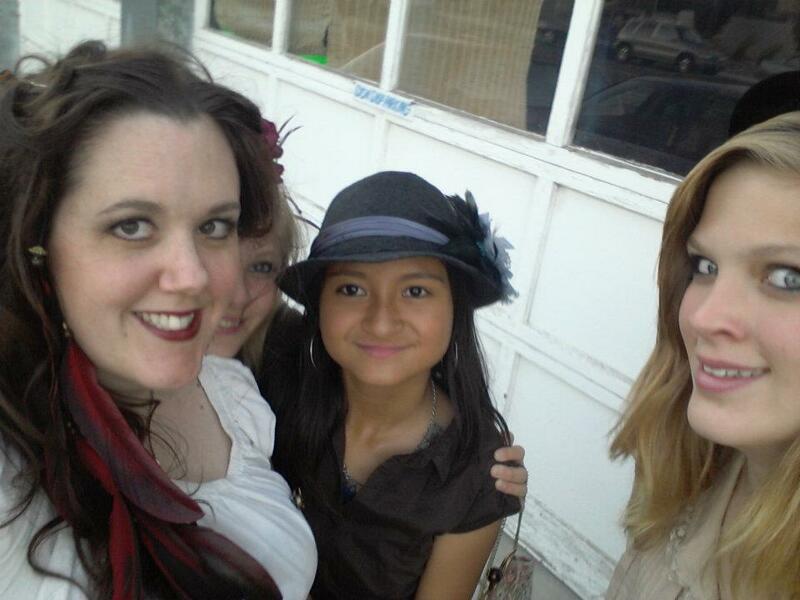 There are Steampunks in Reno!! No funny last Monday because EVERYONE IS GETTING MARRIED and EVERYONE IS IN TOWN, so I’ve been a busy mama. But I wanted to share a fun thing the kids and I did last Friday. My friend Erica Mulkey (known by her performing name as Unwoman, and she’s playing with Amanda Palmer in San Francisco this week, epic squee!) was in Reno, and she put on a lovely show for the local steampunks. So I dusted off my corset, the kids borrowed some of my clothes, and off we went… There really need to be more of “my people” here to attract more talent like Erica; on the other hand, I kinda like us being a rarity, as the shows are so affordable whenever they do happen to drift this way. I got a few clips of her playing, although most of it had to be edited out because of my phone camera’s bad sound quality. Oh, look at my little dorks jumping around in the background! And speaking of Behind the Steam, we just put up a review for Abney Park’s newest album Ancient World, which is one of the last podcasts with crappy audio (I think we still have one more recorded with our old equipment) since I have a new mic and Alyssa has better recording software. We recently did a really fun (meaning bugshiz insane) interview with an overseas steampunk personality, and another one with one of my favorite bands, and we have a few more scheduled that have me fangirling all over the place! Listen to two of my favorite songs off Ancient World and you’ll see why I was so excited to review the album! Oh, what’s that…? 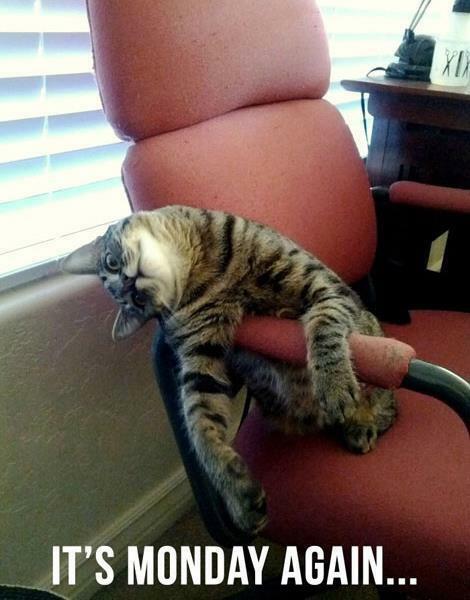 I have to go make dinner now? I have to do laundry and clean the house? But I was so happy here! *sigh* Real life calleth. 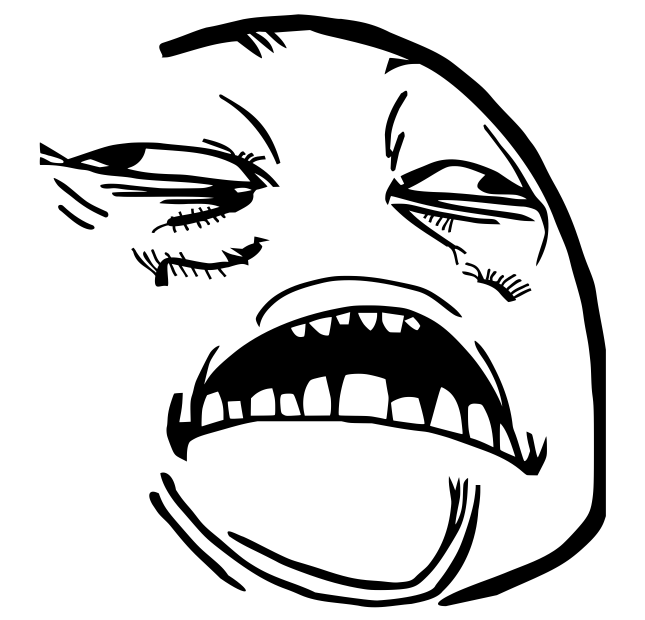 I’m going to be in Boise next week seeing my mom’s new house, so I probably won’t be blogging until I get back. 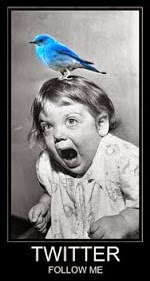 Until then, give mama some comments! Done anything weird lately? I dropped off the face of the earth for weeks! And stuff has been happening, it’s not like I’ve just been this boring lump the whole time – well, today I have, but I have a reason for that. Broken foot or sprained ankle or something. Whatever. I’m not working at Michael’s anymore; we’d thought we were moving to Boise, but that fell through. At any rate, I discovered retail is not my thing, so I’m back at Denny’s, starting tomorrow night. Apparently I’m a great server. 😉 I’m actually pretty excited about it. I miss my old co-workers and my awesome regular customers. I’m just not looking forward to all that walking on a bad foot, even though you’d think I’d be used to my bad feet by now. Speaking of my foot: I was doing Couch to 5K, a beginner’s running program, with Lia. It was awesome. I loved it! And then I did something stupid with my left foot about a week and a half ago, got x-rays that were inconclusive, and every step since then has been agony. But, since I don’t give up (or maybe I just don’t learn), as soon as it’s healed I’m starting back up with the program. The full manuscript of The Moongate is on an editor’s desk. *insert Snoopy happy dance here* I know I keep waffling between self-publishing and small presses – I think I gave up on the small presses too soon. All it took was a very kind request for a full to pull me out of that slump. I haven’t even touched the tip of the iceberg when it comes to researching small presses, and I don’t like giving up without fully exploring my options. Now about Behind the Steam! Oh my glob, we had such an awesome interview last week! The following picture, that’s me just before the Skype interview took off. 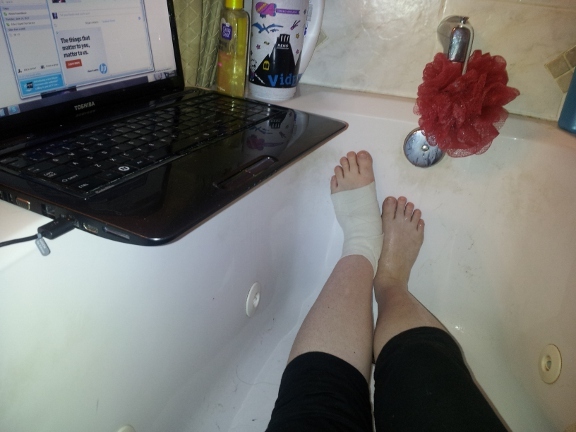 Yes, this extremely glamorous author and blogger does her band interviews in the bathtub. It’s the comfiest place I can lock myself away from noisy kids when I’m trying to be professional and all (hard to do when half the time I’m being a giggly, nervous fangirl), and the acoustics are good, since my laptop’s mic is pretty crappy. You guys might know I have this huge fangirl obsession with a little steampunk robot band called Steam Powered Giraffe… That’s right, we interviewed the band’s very own Rabbit (the crazy guy with the pirate hat in the following video), and the podcast is up now on our blog. Also – the girls burst into tears and killed me when they discovered I interviewed Rabbit without telling them. Oops! Well anyway, go check it out right here! Interesting shiz, right? Especially since I’m a leftie! I wasn’t too happy with some of the stuff here (such as the last one, what the crap), but I liked/agreed with a few. Such as: Half my kids are lefties (my hubby is a rightie); I tested for MENSA and passed, but didn’t wanna join; I despise spiral notebooks, they should all burn; I use the mouse with my right hand (I also shoot a bow right-handed); and yes, I’ve noticed that my boy cat swats me with his left paw. My little leftie kitty! I apologize for the language in this video’s title; I can’t help that. 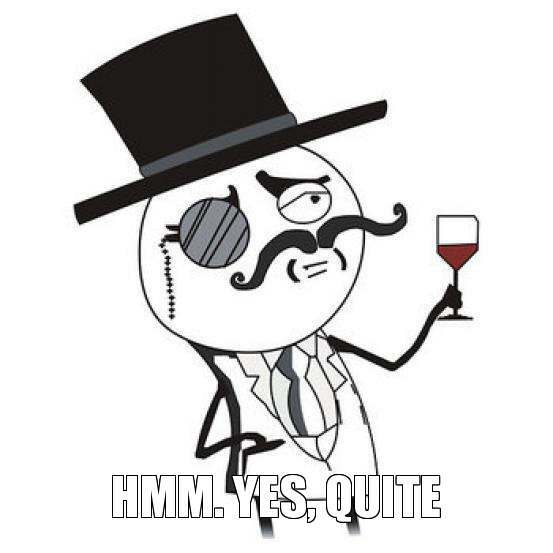 But the video itself is one big inside joke for steampunks (there’s no bad language in it). I have to post it, because I’m guilty of a lot of these sayings! 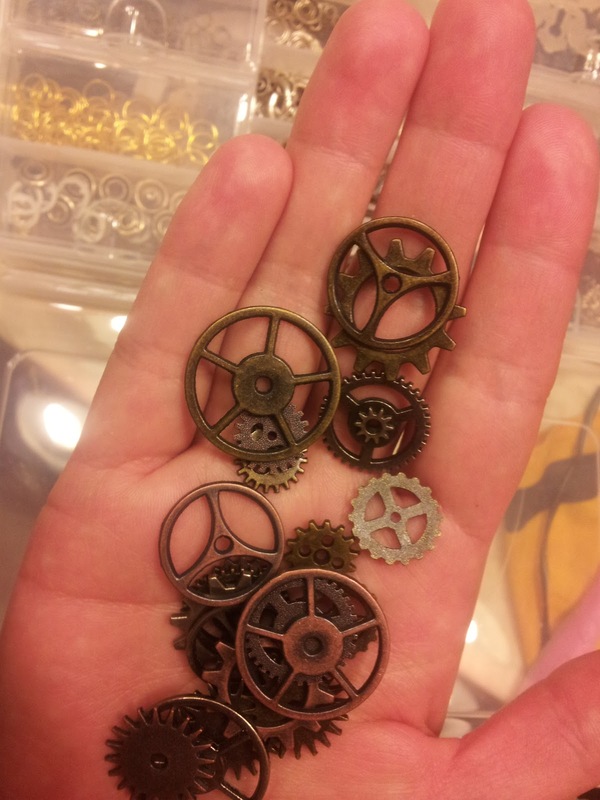 On the subject of “just glue some gears to it,” I bought these shiny babies at work because I want to glue them to some stuff and call it steampunk. A lot of steampunks hate that! But I think if it looks like it could be functional in a real steampunk sci-fi world (My time machine/feathered hairpiece doesn’t really transport me back in time?! 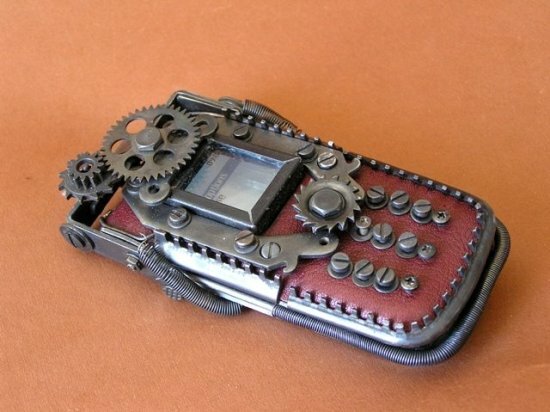 That is so not steampunk!) and is aesthetically pleasing, glue on those pretty gears, baby! Speaking of work, funny story that happened yesterday. I’m working on some downstocking with my manager (dangerous job for clumsy people. I almost fell off one of those big “employee only” movable staircase ladders), and he gets a call over his headset radio that someone needed him at the other end of the store. He says, “On my way. In fact, I’ll skip there!” I watch him walk away, the liar, so I state over my headset, “You’re not skipping!” He then proceeds to skip the rest of the way across the crowded store. I love headset radios! Okay y’all, I did promise to divulge Alyssa’s and my super-secret project today! We launched it a couple hours ago, and we couldn’t be more excited! 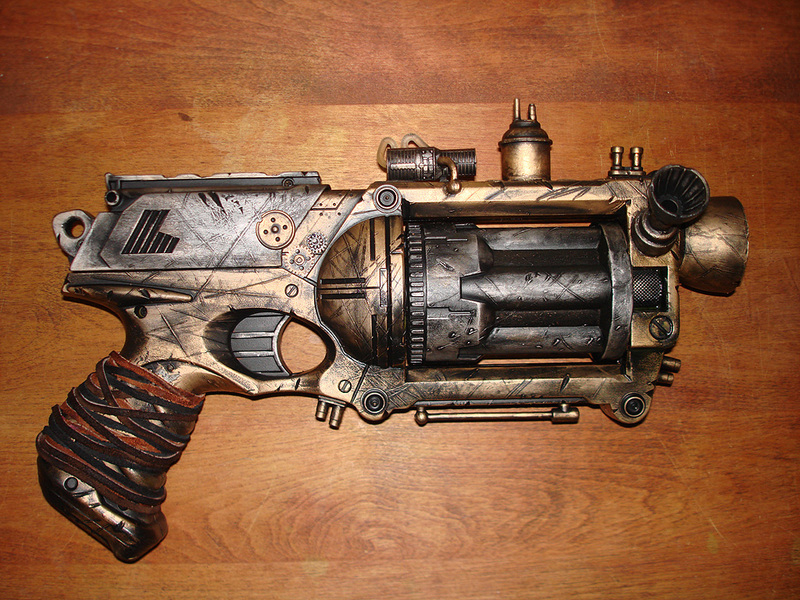 So basically, you pretty much know by now that I won’t shut up about steampunk. I met Alyssa at an Abney Park concert, and a couple months ago she sent me an email along the lines of, “You write and have a cool blog. Wanna go in together and make a blog about steampunk music?” And then I did some kind of fangirl happy dance because the thing I freak out over the most, next to books, is music. Especially steampunk music! So our plans for the blog are pretty simple: We interview musicians of the steampunk genre and put the podcasts up for our followers on Twitter (@BehindTheSteam). 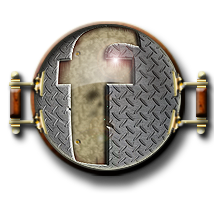 We’ll also post articles and reviews of music, cons, and other steampunk things we geek out over, and as we gain experience and learn new ways to make the blog shine, I think it’s just going to get better and better! Our first podcast, a fun interview between just the two of us, is already up on Behind the Steam’s very first post! It’s available to everyone, not just Twitter followers. I have to apologize in advance for the audio on my end. I didn’t realize my laptop’s mike is so crappy. Half the time I’m bellowing, the other half my voice is just garbled. But it’s still a pretty cool interview, I think! I will be investing in a much better microphone before our next interview. Something I think is really super geek-out-worthy is our opening music, written and recorded for us by none other than Nathaniel Johnstone! I love it; it’s kicky, fun, and goofy. (It’s also going to be my ringtone if I can figure out how to set ringtones on my phone.) And speaking of that guy who plays stringed instruments like some kind of weird, be-kilted angel, check back with our blog on Thursday, where we’ll unleash our interview with him upon the world! MUHAHAHAHAAA!!! That’s right. This guy. Awesome, right? 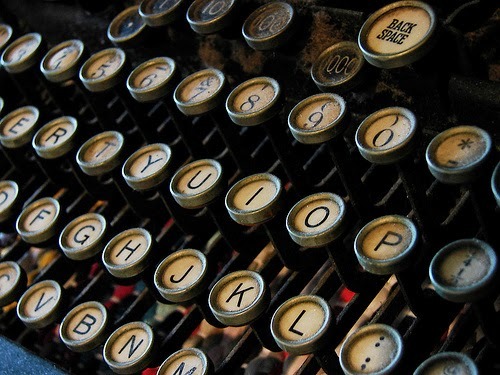 And there’s not much news on the writing front, other than that I’ve queried a few more small press publishers, and will probably stop my search after that and go indie if the answer’s no from all of them. I’ve been doing my research, I’ve looked at the covers from some of the best of these publishers, and I think, “I can do that.” I can also do the marketing and promoting on my own as well. I’m thinking this is shaping up to be a pretty exciting year, creatively! 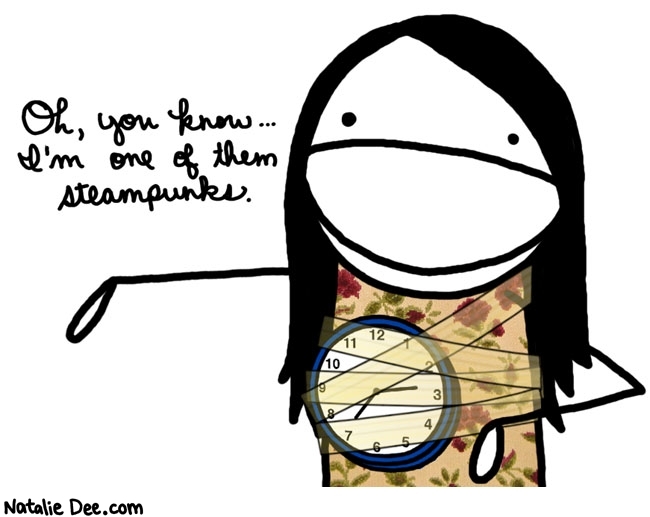 I get asked this question a lot when I tell people I’m working on a Young Adult steampunk novel. Steampunk fiction, along with other aspects of steampunk, is getting pretty popular these days (just look up Justin Bieber’s steampunk Christmas video, ugh). 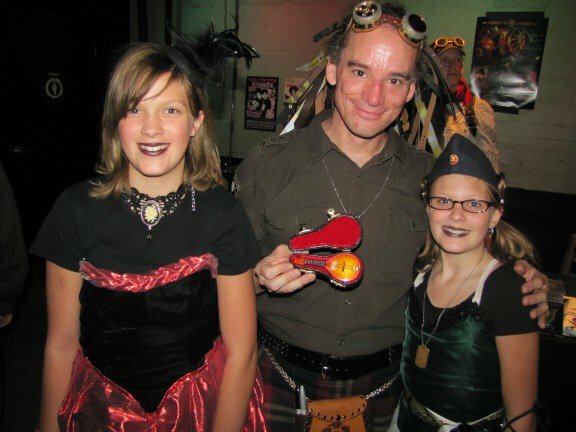 More often than not, people will at least have heard the word Steampunk, but not know exactly what it entails – or how devoted true steampunks are. a gift to her from my mom. Coolest grandma ever? I think so! I’m not going to expound in detail what I think steampunk should be (articles like that already abound on the interwebs), but I’d like to tell you a little bit of what it means to me and how I discovered it, while bombarding your eyeballs with lots of cool pictures (some pictures are embedded with even more informative links). Yep, Victorian sci-fi: It doesn’t get much cooler than the Neverwas Haul, a gorgeous Victorian house on wheels. Most likely runs on gas, but in a real steampunk world it would, of course, be steam powered. 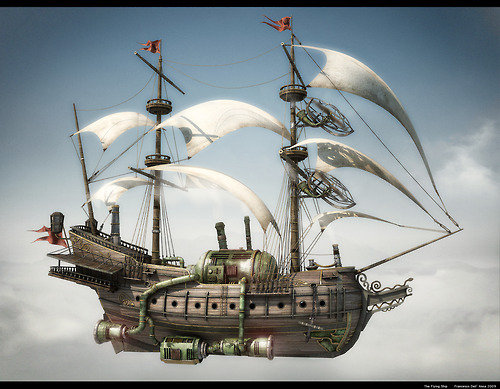 And you can hardly have a steampunk story without an airship in it. 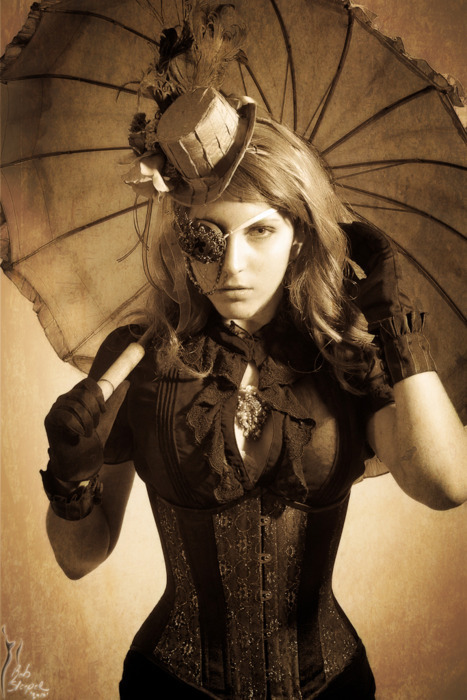 Fashion is a huge deal for most steampunks. This picture freaked me out because of the super-cool gear-encrusted goggle the model is wearing like a pirate eyepatch. (Didn’t I mention one of those before?) What I really love about this is that my character Kate in Cobalt has an injury to her left eye that renders it sensitive to light, and she has a goggle like the one in this picture, with little gears and levers that shade her eye from the light and enhance her vision. I swear I’ve been writing the story for months, but I only stumbled across the picture tonight! Awesome! 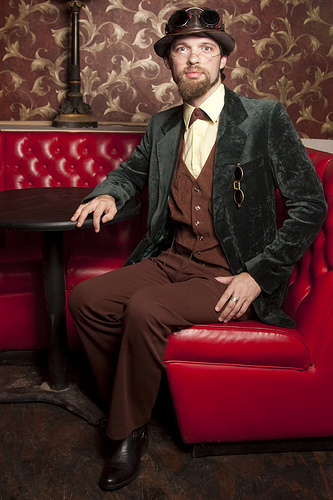 A steampunk gentleman might look like this dapper fellow. Your outfit can be as simple or elaborate as you want it to be. 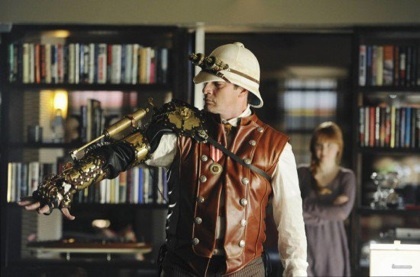 Many of you will have seen the steampunk episode of Castle. In this picture he’s wearing a very expensive variation of the kind of gadget some steampunks add to their personas. 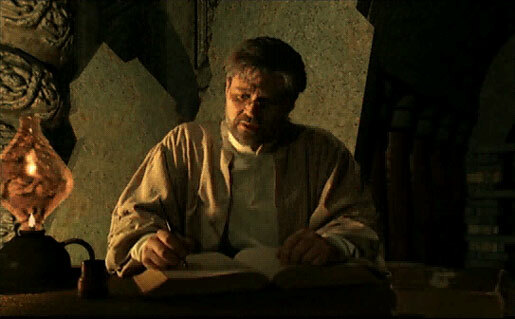 In the mid 90’s I started playing a PC puzzle adventure game called Myst. I was drawn into the beauty of the scenes, and the contraptions and clues you had to solve that were steam powered. The storyline of this game series is so rich that it all stuck with me, and when I discovered steampunk not too much longer after that, I was immediately reminded of Myst. puzzles from steam powered contraptions and machines he’s built himself. A really fun aspect of steampunk is the music. Since music is so important to me, it’s what formally got me into the genre. 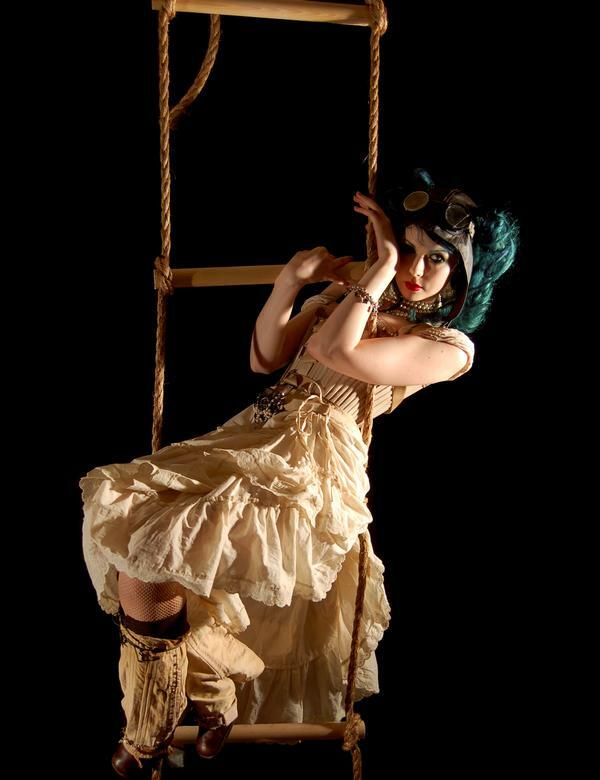 Although there are many steampunk bands that I love, I’ll just share my two favorites, Abney Park and Vernian Process, since I’m trying to encompass a wide variety of steampunk aspects in this post. Ray Bradbury’s Something Wicked This Way Comes. Abney Park’s sound is inspired by widely varying ethnic music and soul-wrenching ballads. 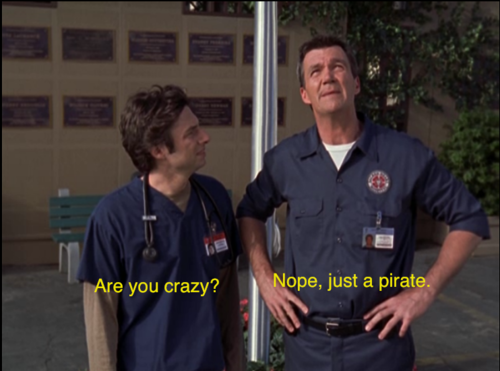 Basically, you could listen to one song that’s a simple pirate shanty, and the next is a wild gypsy tune that dares you not to dance to it. it’ll play one of their new songs from their upcoming album! 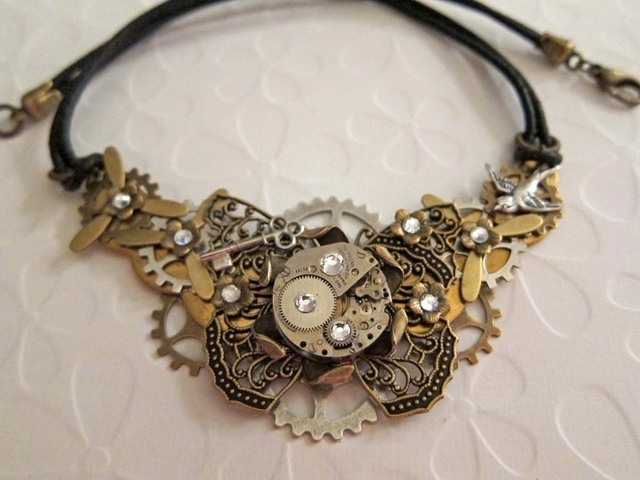 And finally, the part about steampunk that most fans will agree is pretty awesome, are the inventions. 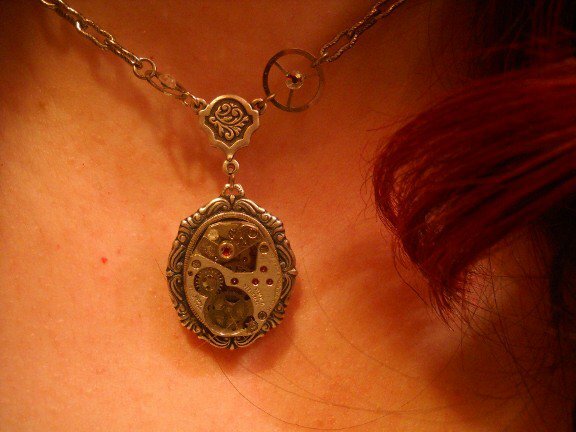 Some amazingly creative and talented people have gone beyond gluing gears to pendants, to add vintage beauty and a sci-fi spin on modern day gadgets. For some truly amazing and functional steampunk artwork, Datamancer turns PCs, laptops, keyboards, and other devices into beautiful, unique treasures. If you only check out one link in this post, make sure that’s the one. 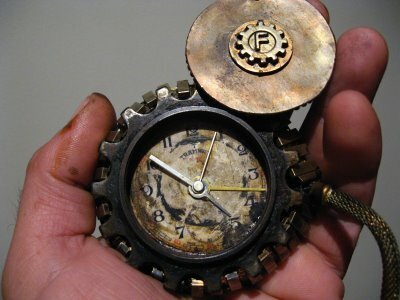 Because yes, something that looks like it could be functional is cool enough, but when it actually is functional, like Datamancer’s work, that’s the true spirit of steampunk. And lastly, on a more personal level: Take a painfully introverted mother of six, who’s never quite fit in with any group all her life, can’t even do mainstream right, and is getting into middle age and not liking it one bit. She’s had post-partum depression for years and feels like she’s lost her identity, but above all, has never let go of her dream to write. She already has one novel under her belt and is well into the second one, and has always loved the weird, the magical, and the less-beaten path. She finally finds something fun to wake her up again, and for the first time in longer than she can remember, the depression lifts. Best of all, her kids think their weird mom is the coolest thing ever, not an embarrassment. And when she takes them to a few shows and is embraced by the steampunk community and makes some awesome new friends, she knows she finally belongs somewhere. 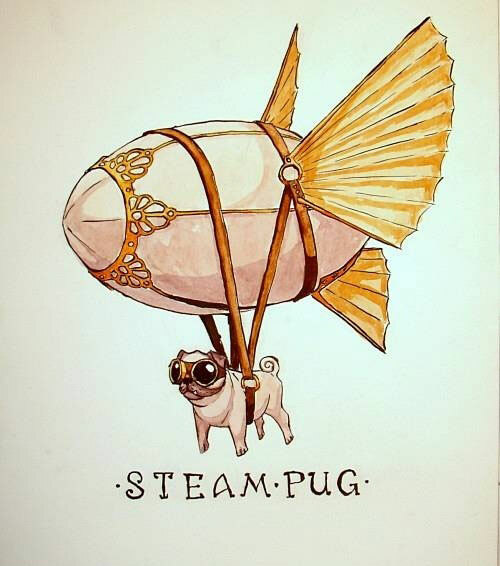 This is what steampunk really is to me. Normally I don’t go into detail describing clothes. Even though I write fantasy, and the clothing my characters wear look detailed and fantastical in my head, I try to limit descriptions of anything, including clothing (especially clothing) to one or two paragraphs. Or I’ll drop hints during the narrative or dialogue that give the reader a few clues about what the characters are wearing, and let them fill in the blanks with their own imaginations. Usually readers don’t like lengthy descriptions. 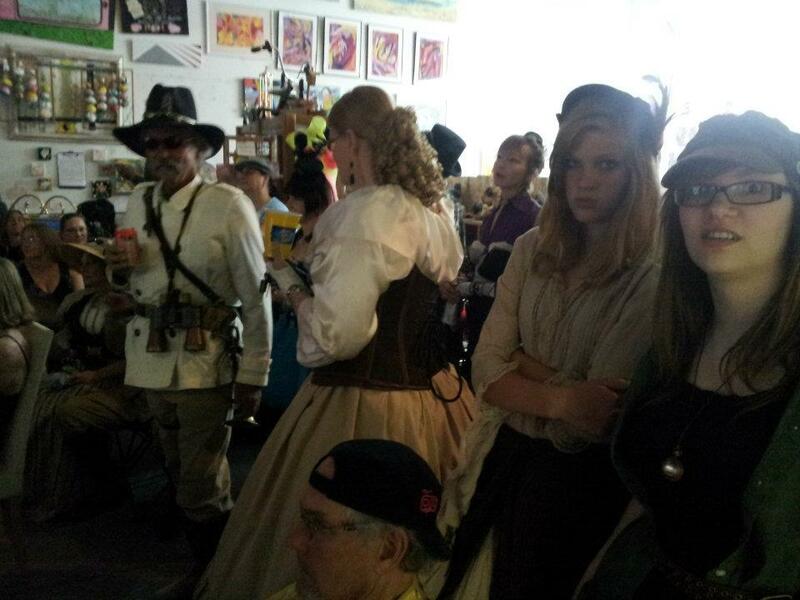 But if you know steampunks, you know they love their fashion. There’s a scene in Cobalt when Kate and Ania need to change their clothing to blend in with a less fancy crowd. Because of a condition Kate has, her own clothing needs to be adjustable, and a couple times I thought it was needed to remind the reader of that fact, so it didn’t look like I was being careless and forgot. 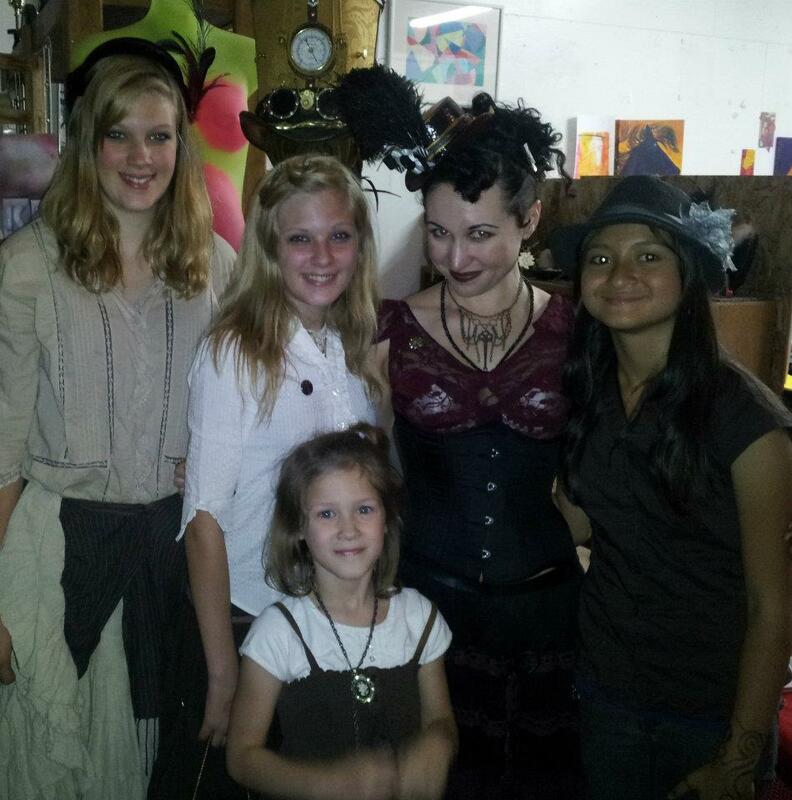 But mainly, I just wanted to have some fun dressing up the girls in some cool steampunk outfits! There are a couple of pictures at the end of this post that slightly inspired Kate’s clothes, but read it first and then tell me if I painted a decent enough mental picture. Milek shrugged and headed down the hall to pillage some more. Ania removed her dress and petticoats, then pulled on a plain brown tunic with some black breeches. “It’s a lucky thing Stark is a small man.” She selected a leather belt with many little compartments, hooks, and loops attached to it, and strapped it around her waist. “Why can’t I just keep what I’m wearing?” Kate had grown fond of her shift with elegant, flowing sleeves, and the embroidered bodice. Ania found a small pair of tarnished scissors in their pile. Kate stifled a dismayed cry as she started snipping around the circumference of the skirt, until the lower half fell to the floor in a heap of of silk and lace. Her bare legs stuck out of a skirt that barely reached mid-thigh. The faded brown pants fit snugly around her legs, easily tucking inside her boots when she pulled them back on. She looked at the chopped-off remnants of her skirt with a regretful sigh. Leaning down, she tore a strip of lace from the ruins, then tied her hair back. “Well, you don’t see any bosoms hanging out, do you?” Ania started lacing up her boots. He held it out to her. A black leather belt and sheath, etched with swirling designs, encased a delicate silver hilt embedded with round sapphires. Like miniature globes, they shone the exact color of Cobalt. She grasped the handle, carefully pulling it out of its leather casing to reveal a slim blade, gleaming blue-white from the light of the real Cobalt lamps in the room. “Agreed.” Milek grabbed a pack from the pile and went back down the hall. 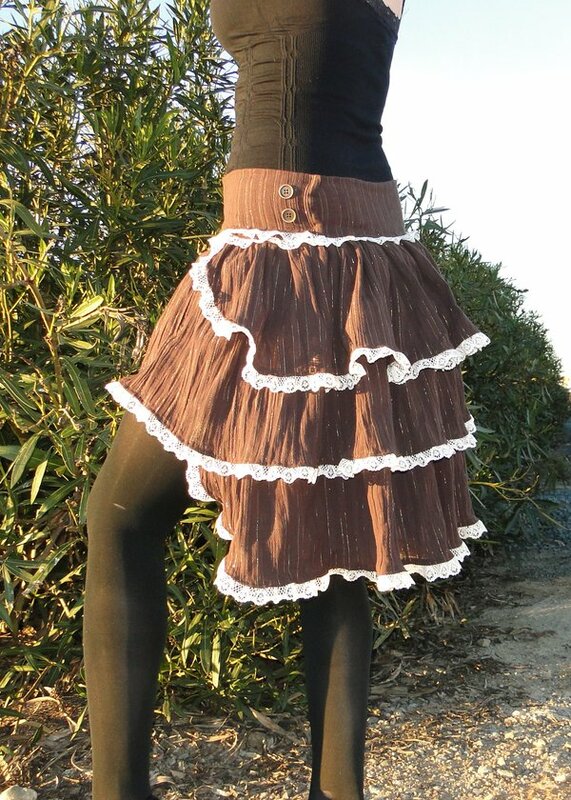 I love Magdalene Veen’s vagabond steampunk style, but since Kate is 12, the half-skirt would be topped with a more modest shift and bodice. This skirt is very cool, though, just about what Kate’s would look like. 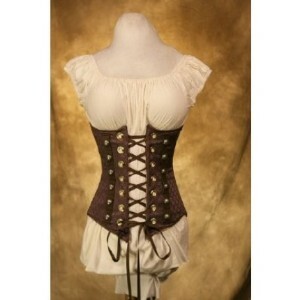 I have this exact same chemise and corset, from Damsel in this Dress! (Except mine is burgundy with gold embroidery. The color of Kate’s, if I remember correctly from a previous chapter.) The bodice’s lacing makes Kate’s top as adjustable as she needs it to be. Now I need to ask your honest opinions. Am I describing too much in this scene? Did I balance the action and dialogue well with my descriptions of their clothing? 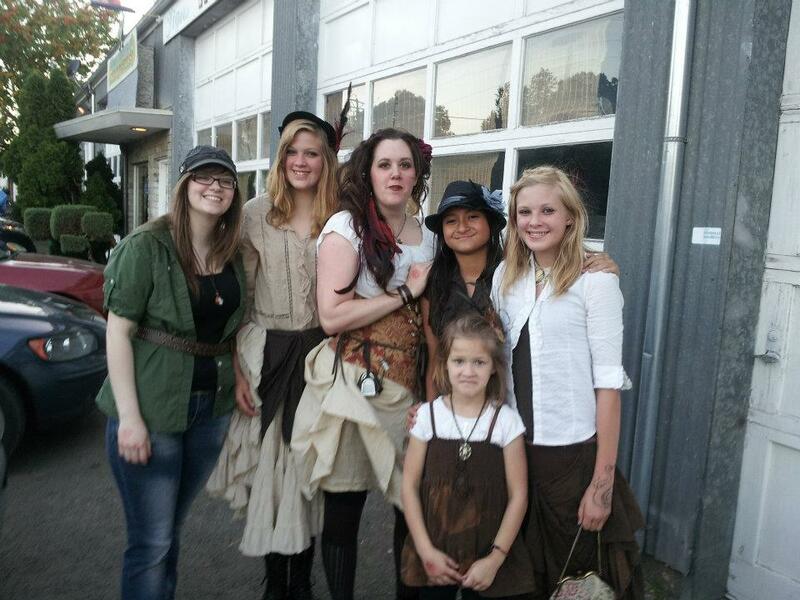 Or did I let my love for steampunk fashion overwhelm my storytelling? And, as always, I want to know your methods. How do you describe something your character is wearing? Especially if it’s something unusual or has a specific design or function, such as Ania’s belt or Kate’s knife?